A small dining room is not a big issue anymore with latest designs available in 2018 you can get the best pieces of furniture to enhance your small dining area beauty and elegance. 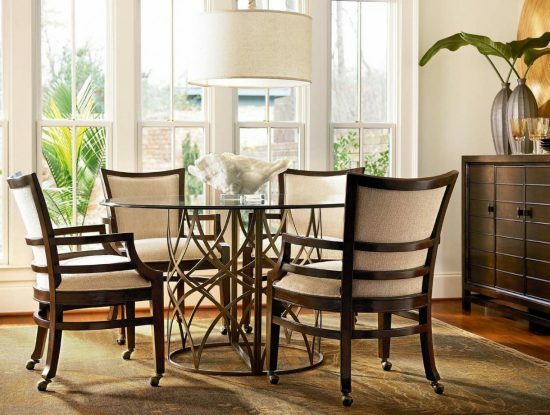 you will be able to get comfortable and yet elegant furniture set to add your dream style and atmosphere to your small dining area. Let’s read this article to know what to pick when furnishing a small dining room in 2018. First, you may ask yourself what the essential pieces are for a dining area in general and then, we can talk about the best furniture for a small dining room. What to consider when furnishing your small area, keep the area simple and free of clutter, while the furniture piece itself should be small in size and with curvy design and few decorations. The basic furniture elements are the tabletop, seating chairs and some few accents to brighten up the whole area. Let’s begin the fun when decorating a small dining room in 2018 start with the tabletop as a focal point but for a small room, you need something fits the small space and at the same time, catch your guest eyes. Round tables are the best for a small dining area but if you need something unique and creative go for glass top table with a pedestal base which gives the illusion of larger space. this is the power of transparent pieces even a table or chairs. This leads us to the next step; 2018 chairs for small dining rooms which lend your area a splendid atmosphere with a bright look. The best for small dining rooms is the acrylic seating which will go well with the glass tabletop. To add a pop of colors you can get some colorful cushions. Finally, mirrors as accents are the perfect addition to a small area to add a spacious feel. Then, lights are important to complete the bright and spacious look. Simple chandelier and small sconces are great and add a warm atmosphere to your 2018 dining small area.